The Red Cross pulled its racist swimming posters. It’s still fixing the damage. Last summer, the Red Cross pulled its racist swimming posters. Has it done anything about racism in swimming? The Red Cross poster fracas was more than just another one-off outrage of the day. Margaret Sawyer spent part of last summer driving across the country, stopping at public pools along the way to let her small children cool down and burn energy. Without intending to, she also set off a public relations crisis for the Red Cross. At a pool in Salida, Colorado, Sawyer was idly reading some safety posters while her kids splashed nearby. At the top of one poster, pictured above, a cheerful whale announced “Be Cool, Follow the Rules.” The illustration below showed a pool in which various “cool” people follow proper water-safety procedures while other “not cool” types engage in risky behavior. A “cool” blonde girl waits her turn by the diving board, for example, and a “cool” fair-skinned dad minds his small child. The vast majority of the “not cool” rule breakers, meanwhile, have brown skin: One boy runs through a puddle, another dives too close to a swimmer, and a little black girl pushes a white girl into the pool. “How can this be, that the white kids are the ones doing good and the black kids are doing bad, and no one noticed it?” Sawyer remembers thinking. The 136-year-old aid organization has had more than its share of five-alarm scandals in recent years. In 2014, NPR and ProPublica exposed how the Red Cross botched its responses to Hurricanes Sandy and Isaac, diverting 15 emergency response vehicles to press conferences at the height of the post-Sandy crisis. The following year brought another devastating exposé from NPR and ProPublica, this one on how the group squandered $500 million in donations for the Haiti earthquake disaster. CEO Gail McGovern had been hired in 2008 to clean up an organization that was running a huge annual deficit; her short-lived predecessor had been asked to resign after it came out that he’d impregnated an employee. After all this, the poster dust-up was, relatively speaking, a minor embarrassment. The story quickly met the fate of most outrage-provoking stories: It disappeared. The Red Cross’ chief public affairs officer, Suzy DeFrancis, outlined those changes to me in a lengthy email sent in response to an interview request, which the organization declined. On paper, it certainly looks like the Red Cross has “worked very hard in the past year to elevate our internal conversation on diversity and inclusion through action,” as DeFrancis put it, in a textbook example of why journalists always prefer phone interviews to ones conducted via email. But has the organization made any meaningful progress in helping make the water a safe and welcoming place for black children? The poster fracas was more than just another one-off outrage of the day. It has roots in an entrenched history of white racism and paranoia that has prevented black families from getting access to safe swimming areas. In the segregated 1920s and 1930s, many towns provided large outdoor pools for white residents, and—if anything—a small indoor pool for blacks. Desegregation changed the landscape. In 1949, when a group of black citizens of St. Louis tried to swim at the Fairground Park pool, a mob of 200 white people chased them off with bats, knives, and bricks. Many Southern towns eventually filled their pools with cement, with whites preferring to avoid swimming rather than swim with black people; private clubs and backyard pools often replaced them. Today, black children drown at 5.5 times the rate of white children, according to the Centers for Disease Control and Prevention. Meanwhile, 64 percent of black children have no or low swimming ability compared to 40 percent of white children. Just more than 1 percent of the 330,000-plus members of USA Swimming, the organizing body for competitive swimming, are black. 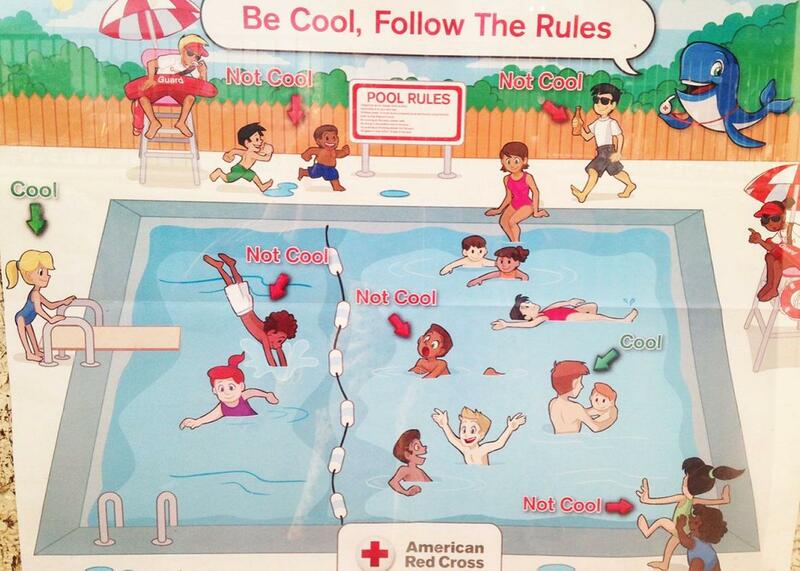 And negative stereotypes about black children and swimming still linger in places like the Red Cross poster. It’s relatively simple for an individual to figure out how to be welcoming. It’s a much more challenging task for an enormous organization, particularly when the public stops paying attention and the real work begins.